Wall Street is still not sure what to make of Federal Reserve chief Jerome Powell. Stocks, which closed in the green Thursday, briefly dipped into the red after Powell pointed to more monetary tightening ahead, including continuing to shrink the Fed’s $4 trillion balance sheet. “It will be substantially smaller than it is now,” Powell said Thursday at the Economic Club of Washington, adding that the balance sheet needs to be at a “more normal level” without clarifying what that level was. That was enough to give traders pause and send the Dow Jones industrials down more than 40 points. Traders were already wary of statements Powell made in December about rate hikes. 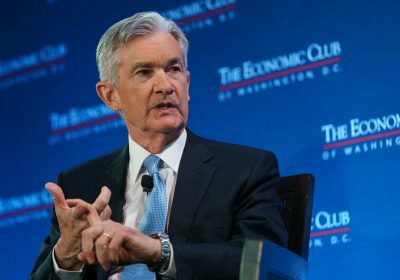 Thursday’s brief drop stood in contrast to the response to Powell’s remarks last Friday, when the Dow surged 747 points after Powell said the Fed is willing to be “patient” and “flexible” about future interest rate hikes — sentiments he reiterated Thursday.